Today, Prime Minister Viorica Dancila had a meeting at Victoria Palace with the UK Defence Secretary Gavin Williamson during which they discussed about the development of the Strategic Partnership, the consolidation of the bilateral relations, and the observance of the rights of the Romanian nationals in the U.K. in the context of Brexit. Prime Minister highlighted that cooperation in the field of security and defence as well as the economic relations represent the pillars of the Strategic Partnership and the financial, education, development – competitiveness, trade and investment sectors are important components of the solidly developed Partnership between Romania and the United Kingdom. 'Romania is interested in strengthening the Strategic Partnership with the United Kingdom of Great Britain and Northern Ireland, for it to be best tailored to current challenges, in the spirit of the real development potential and common expectations. Bilateral trade reached the highest level in the history of our relations, amounting to EUR four billion. It is nevertheless important to identify new ways of cooperation in the field of investment and trade, taking into account the fact that Romania offers an attractive business environment', stated the Head of the Executive. The UK Defence Secretary Gavin Williamson appreciated the level of bilateral relations, as well as the important role that Romania has in the North Atlantic Alliance. Bilateral cooperation has become increasingly valuable and the development opportunities must be further capitalized, especially in the defence and security, economic, research and science areas. 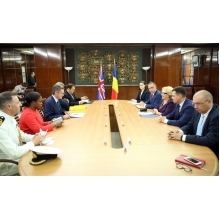 In this context, the two officials discussed about concluding a new Cooperation Agreement in the field of defence between Romania and United Kingdom, adapted to current context. They also agreed on establishing bilateral meetings of relevant Ministers, with a view to making the best use of the cooperation potential between the two countries. Observance of the right of the Romanians who are studying and working in the United Kingdom, in the context of Brexit, was also discussed by the two officials. 'For the Romanian Government, protecting the rights and interests of the Romanian nationals in UK is an issue of great interest. We have developed governmental programs to persuade an increasing number of Romanians abroad to return home. But, many of them are well –integrated and have made an important contribution to the societies of the states in which they are living. The Romanian community represents a bridge between our countries. We are honored by the decision of the British authorities to award a distinction to our compatriot Florin Morariu for his acts of bravery in the context of the London 2017 terror attack”, emphasized Prime Minister Viorica Dăncilă. The British Secretary of Defence voiced his opinion that Romanians are well –integrated in the British society, stating that they are 'motivated and well-educated'. Attending the meeting at Victoria Palace was also the Minister of National Defence Mihai Fifor.